This is the place to showcase you a variety of apps & sites running directly on the Shoudio Platform. Shoudio apps & sites vary from (GPS-based) audio / multimedia guides to self-initiable-interviewtools to audioreporting and storytelling audiomaps. All our services can be heavily customized to specific needs. Tip: use your left & right arrow keys to explore all apps! 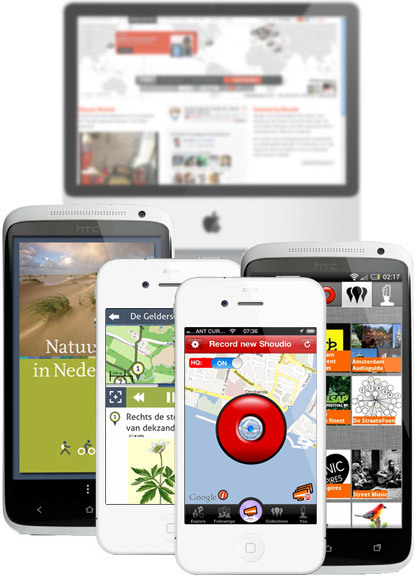 Whitelabelled Shoudio apps can be for example audioguides or multimedia tours including offline maps and audio content. Offline availability makes the Shoudio apps ideal for touristic markets (roaming) or usage in remote areas (or indoors). The apps can be further enhanced with imaginary, video, unlimited tours and custom tabs to fit your users' needs. A great way to reach your apps' userbase is through our push notification system. Send a targeted message to regain active users in your app. When users are following a tour and they exit the app, they will still receive notifications when they come close to a new Point of Interest. With Beacon technology you can enable your app to serve content based on the user's whereabouts, just like with GPS, but indoors or in other places where GPS is not suitable. Our services cover the design and implementation of custom integrations for your wishes. Detailed Analytics: View app downloads through your dedicated monitoring account through App Annie and check reports on app usage via our built in stats reporting tool and hookup Google Analytics for detailed analysis. Easy updating tours: Change the contents of tours, add new tours, or remove some and republishing the content of your apps instantly, without the need to publish app updates in the appstores. Quiz tours: Make multiple choice quiz tours with self-checking answering module through our CMS. Extensive CMS: Basically our CMS consists of a fullscreen map application on which you can draw your tours, with all kinds of usefull hooks such as Excel import, Wikipedia sync, Batch edit, etcetera.